Flatbed trailers are typically exposed to the elements. This exposure is usually where flooring may suffer weather-related damage. To preserve the properties of Apitong wood we recommend regular review of all wooden surfaces on your trailer. You have to pay special attention to horizontal surfaces, as they are much more exposed to weather influences than vertical ones. The most important external elements that affect both the strength and appearance of the wood are fluctuating climatic conditions and weather effects such as sun, rain, wind, snow, polluted air and the like. Wood is a hygroscopic material, which means it naturally takes on and gives off water to balance out with its surrounding environment. Wood shrinks/swells when it loses/gains moisture below its fiber saturation point. 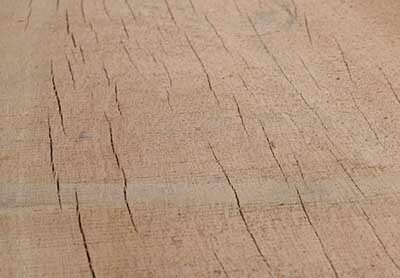 This natural behaviour of wood is responsible for some of the problems sometimes encountered when wood dries. 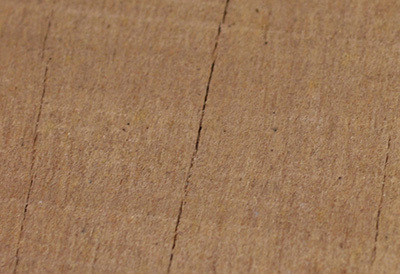 For example, cracks and checks can result from stresses induced in a piece of wood that is drying. As the piece dries, it develops a moisture gradient across its section (more dry on the outside, more wet on the inside). The dry outer shell wants to shrink as it dries below fiber saturation, however the wetter core constrains the shell. This can cause small cracks called “surface checking” or “season checking” to form on the surface. Besides checking caused by moisture, high temperatures may also potentially damage your floors. Damage of this nature typically takes the form of shrinkage to the face of the decking due to rapid moisture loss. The result is that larger than normal spacing will appear between boards. This can also potentially be accompanied by concave cupping of the Apitong decking. 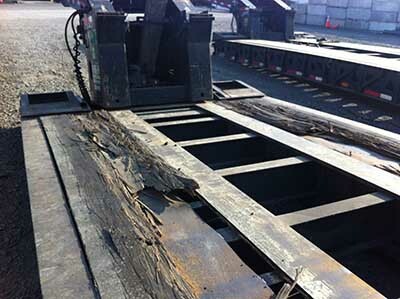 Another major source of potential damage to Flatbed Trailer decking is sunlight. Sunlight can damage the cellular structure of wood. UV rays break down the materials that hold the wood fibers together. You have probably seen how these UV rays can destroy the deck chairs and cushions at your home – the same holds true for your Apitong Floors! Keep in mind that wood will adjust to its surrounding environment. 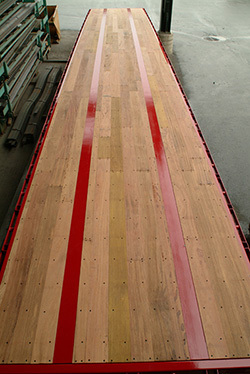 Despite steps taken during the manufacture of your trailer boards, even properly seasoned decking has the potential to change dimensions after installation if the right conditions are present. It is important to understand that extreme swings in climate during summer and winter can adversely affect your trailer decking. In order to minimize the potential damage caused by the weather, we therefore strongly urge customers to consider applying a good quality finish to all exposed surfaces of your trailer deck. 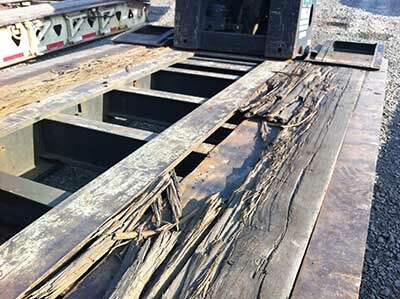 The cost of labor to apply a good finish to your Flatbed Deck is minimal when compared to the potential damage and degradation, which occur from the elements. It usually takes less than an hour’s labor and just a gallon or two of deck treatment to properly protect your floors. 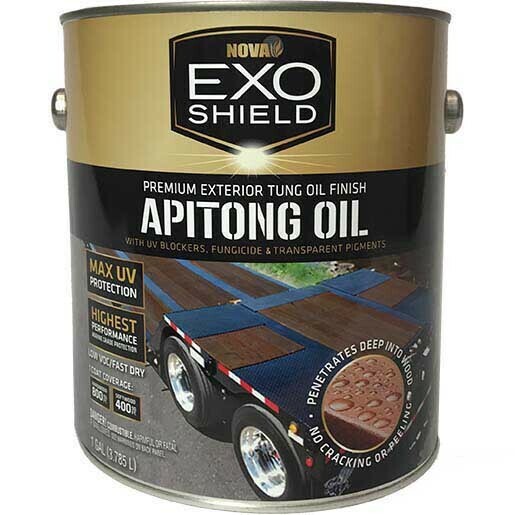 Our own APITONG OIL is an extremely high quality Tung Oil product with UV blockers, high quality transoxide pigments and a fungicide. Only the best possible ingredients go into our APITONG OIL. And it's made right here in the USA - in Portland, Oregon. In order to avoid damage caused by the elements, there are basically two types of deck treatments to consider - 1) a semi-transparent oil stain or 2) a water repellent preservative. Of these two, we at TrailerDecking.com recommend the oil stain. Oil stains are either vegetable oil / linseed oil based or they are Tung oil based. Our own APITONG OIL is made from Tung oil which dries flexible and will not turn rancid inside the wood fibers like the vegetable oil / linseed oil products. Any oil based stain you consider should contain a fungicide and a UV blocker. These are critical components to the long term health and longevity of your trailer floor. Our APITONG OIL has been extensively tested against the inferior linseed oil and vegetable oil products and we have found the the pure Tung oil protects the wood much more effectively and doesn't allow the typical weathering that most of us have experienced with typical wood decking finishes. The clear water repellent preservatives often are a wax or a silicon base that seals the surface, but soaks less deeply into the wood. The water repellant preservatives are usually less expensive (only about half the cost of good quality oil stains) but they really should be reapplied every 6 to 12 months. These products do not dry or harden effectively in order to provide long term protection. Check the label to make sure your deck treatment contains water repellents, mildewcides and UV blockers. We at Nova USA Wood Products and TrailerDecking.com offer a wide variety of Apitong products for the trailer and truck body industry. We purchase only the best materials from reputable mills that place and emphasis on quality and delivery. We are also one of the few suppliers who have overseas inspectors in place to ensure that material is thoroughly checked before it departs the mill. This final inspection ensures that you get exactly what you ordered each and every time. We certify all of our trailer decking products and warranty them against defects in workmanship. If you have any questions or would like more information, please contact us at 1-855-APITONG.